Shivers is a chronic nervous or neuromuscular syndrome in horse. While considered uncommon today, it mainly affects draft horse breeds. It develops gradually and is not easily noticed. Severely affected horses may be hesitant to lie down and as a result may lose body condition and consequently appear older. More worrisome to Kim was the fact that there is no effective treatment or cure for shivers, the disease is slowly progressive, debilitating and may eventually result in early death because of profound weakness, muscle wasting, discomfort and incapacitation associated with the episodic muscle cramping. The idea that Rose could have such a debilitating disease was heart breaking to Kim. As Kim’s second Shire horse, Rose is a part of the Smith family; she is registered as Gentle Giant Rose Royce with the Canadian Shire Horse Association. She was raised outside Calgary by Gentle Giant Shires- Blake and Fran Anderson. Her father was imported from England and her mother was raised by the Andersons. “My first shire is Rose’s half –sister, Gladwin Jubilee Reign, both sired off the same stud. Reign is a two time American National Shire Champion Mare and former Canadian Champion. After I got Reign I fell in love with the breed.” Reign and Rose are the best of friends and have been together for seven years. Rose has shown as a two–year-old and a three-year-old both in halter and in hitch. She was a spectacular show horse. In 2008, she earned Junior Champion and Reserve Grand Champion Clyde/Shire Mare at the Michigan Great Lakes International Draft Horse Show, the largest in North America. She was also Junior Champion Shire Mare at the New York State Fair and she was Grand Champion Shire Mare and best of breed for the Shires at the Keystone International Livestock Exhibition in Harrisburg, Pennsylvania, that same year. In 2009, Rose went to the American National Shire Show in at the Minnesota State Fair and was National Junior Champion and Reserve Grand Champion Mare. She has won numerous classes at Ontario Fall Fairs. She hurt one of her back legs after turning four and could no longer be shown. After several diagnostic tests, OVC’s team was able to deliver great news to Kim. Tests revealed that Rose did not in fact have Shivers; OVC’s Dr. Dan Kenney determined Rose was affected by Equine Protozoal Myeloencephalitis also known as EPM. Difficult to diagnosis, EPM affects the neurological system. “The symptoms can be very similar to Shivers and can often be mistaken for Wobbler syndrome, the neurological form of herpes virus infection (nEHV-1), rabies, West Nile virus or other equine viral encephalitis diseases, for example, Eastern and Western equine encephalitis.” Says Dr. Kenney. EPM is most commonly caused by a parasite named Sarcocystis neurona. It can develop in horses if they ingest the contaminated feces of opossums although other scavenger animals may be carriers. Once the parasite has been ingested, they migrate from the intestinal tract into the blood stream, cross the blood/brain barrier and attack the central nervous system. 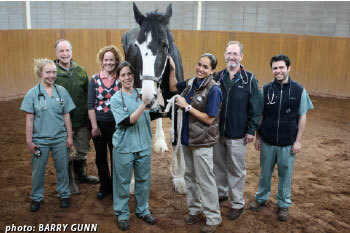 While treatable, EPM can cripple a horse slowly or very quickly. The clinical signs may appear in weeks or up to five years or more after initial infection. Signs in mild cases may be limited to mild ataxia. In the most severe cases, horses may be unable to swallow or stand. If undiagnosed and untreated, the disease can cause serious and lasting neurological deficits. Luckily for Rose she was diagnosed early. Even better news for Kim was that EPM can be treated with prescription medications and early detection means more successful treatment and prevention of further damage. Dr. Kenney notes that while there is currently no vaccine available for EPM, preventative measures can be taken and include the development of wildlife management systems in stables and on the farm property. Rose has been through a lot but she is coming home and she is going to live a long, happy life. Someday when her strength is back, we may hitch her with Reign and go for a drive in the country. 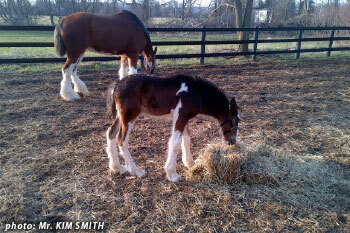 As for Westwind Ken Danby, now three weeks old he is doing great back at home. With the weather getting better he has been outside with his nurse mare all day long for the past few days. He is trying to eat hay and thinks he is a pretty smart fellow. After all he is a Shire!! Kim Smith is the owner of Westwind Farm with high quality Shires and Clydes. A retired lawyer he is also the owner and director of Camp Tanamakoon for girls in Algonquin Park and during the summer months he and his wife also operate Bartlett Lodge in Algonquin. Timelapse: Newborn Shire Foal's First 2 hours of Life in Under 30 Seconds YouTube video of Westwind Ken Danby’s first two hours of life with OVC’s Neonatal Veterinary Technician Meghan Longley.